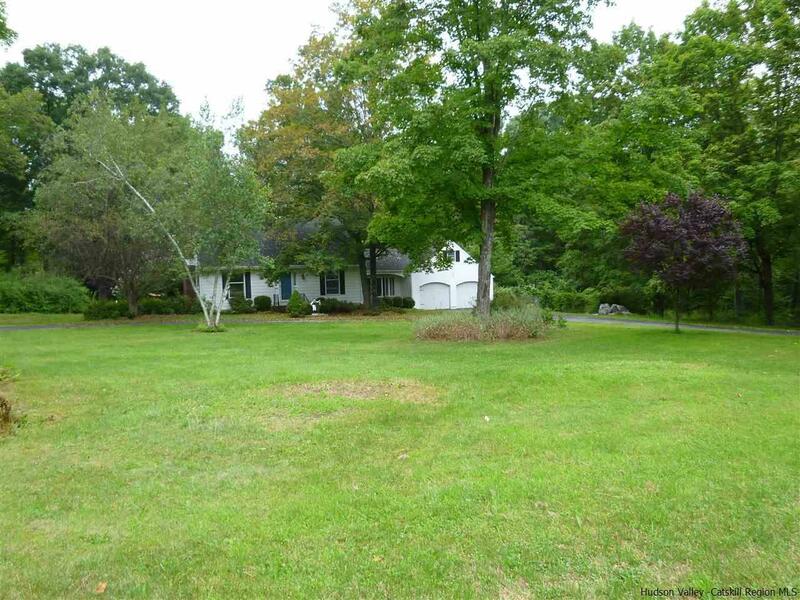 A spacious and elegant home plus two story barn in one of the best locations in Ulster County. Close to Rosendale, Stone Ridge, High Falls and Kingston with direct access to the Rail Trail for biking, hiking and dog walking for miles! Well set back from the road and with a paved circular driveway this home has great curb appeal. Enter through a classic center hall with beautiful new ceramic tile floors toward the living room with the fireplace you've always wanted to your left, or straight ahead to the updated and very large kitchen brimming with tons of cabinets and pantry space, stainless appliances, expansive counter space, and a view of the landscaped backyard, patio and fenced in garden. From the dining room step into the 400 sq. ft enclosed sunroom which is not included in the home's square footage yet adds a tremendous amount of additional 3 season living and entertainment space. There is also a family room on the other side of the kitchen which could be a great play room, office, exercise or TV room. In addition to the first floor bedroom and updated full bath, there are two very sizeable bedrooms upstairs, one of which is currently used as office and craft space, and a fourth bedroom/bonus room over the garage which is used as a music studio. The second story bath was fully and tastefully renovated with custom walk-in shower and radiant floor. So much versatility and a lot to love in the house. But wait....with its own driveway and set way back from the main house is the barn. Downstairs have all the storage or workshop space you could ever need, and upstairs is a mostly finished one bedroom apartment with kitchen and bath roughed in. (no water or septic hooked up) Light and bright for potential future air B&B income, extra guests, yoga classes, or a fantastic art studio. Beyond the barn is a pathway which leads to the O&W rail trail - you can't see it from the house or property, but you have your very own private access. No need to load bicycles on the car or drive your dog or yourself somewhere for a long, safe walk. Have everything you need for a healthy and happy lifestyle without leaving home.